Charles Estienne, La dissection des parties du corps humain divisee en trois livres. Paris: chez Simon de Colines, 1546. Item from the Cole Library COLE–X092F/02, University of Reading Special Collections Services. Plate from Estienne’s ‘La Dissection’ depicting dissection of the uterus, showing twin foetuses. 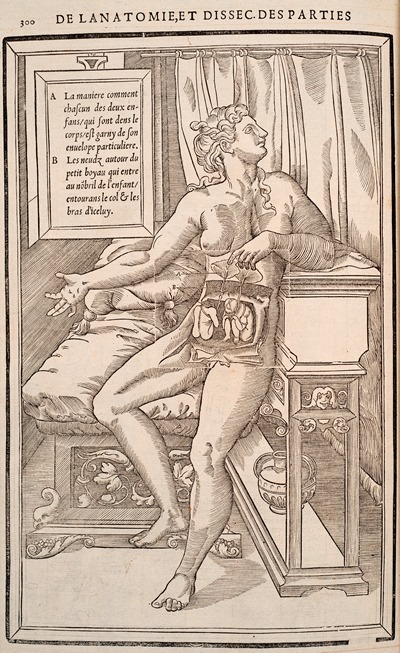 Charles Estienne’s La dissection des parties du corps humain is one of the great illustrated anatomical works of the sixteenth century. It offers a fine example of the accomplishments and innovations of the Parisian printing houses of this period, and its full-page woodcuts have fascinated readers to this day. To read about this fascinating publication, see our newest featured item by Erika Delbecque (former Liaison Librarian for Pharmacy and Mathematics) on our website. This entry was posted in Favourite Finds and tagged anatomy, Charles Estienne, printing. Bookmark the permalink.